If you are looking for new construction in Keystone, Colorado real estate check out the River Run Townhomes. 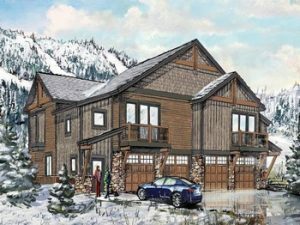 This new construction in Keystone, Colorado will feature high-end luxury residences with spacious floorplans and mountain views. Located on Erickson Loop just west of Expedition Station, these Keystone townhomes are ideal properties for winter and summer. The first phase of the River Run Townhomes construction will be 3-bedroom duplex residences, starting at $939,900. Each property will offer decks/patios with the option to add a private hot tub and 2-car garages. Superbly located, owners and guests can walk to the Gondola in River Run Village or take the shuttle to the Mountain House base area. In addition, enjoy access to the Dakota Lodge outdoor year-round heated pool and hot tubs located in River Run. For floorplans, finishes and additional information about the River Run Townhomes or other properties for sale in Keystone, Colorado contact Justin and Krystal Knott with LIV Sotheby’s International Realty. Call us to discuss your search at 970.333.9050, browse the entire Summit County MLS with us online or email us directly at knott@sothebysrealty.com.